Min Pressure (W.C.): 5″ W.C.
Max Pressure (W.C.): 10.5″ W.C. 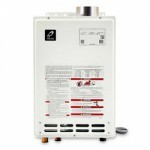 The T-M32 is a fully modulating, gas-fired, tankless on-demand water heater specifically designed for heavy-duty commercial applications. The T-M32 offers “true commercial grade” components and can be Easy-Linked and Multi-Linked to meet high demands. It can be installed either outdoors, indoors, or direct-vented. 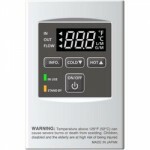 It can supply to domestic hot water systems or to heating applications (local codes dictate proper compliance). Features HRS35 Copper alloy and a thicker heat exchanger drum for added durability. Multiple units can be combined in a system of water heaters to provide for larger applications such as hotels, large restaurants, apartment complexes, etc. The T-M32 is also backwards compatible with the T-M1 model, making any additions or replacements to current T-M1 systems easy and simple. Please check with all local codes prior to installation. The versatility of being installed either indoor, outdoor, or with a direct vent, all with the same unit. Easy-link capability up to 4 units. 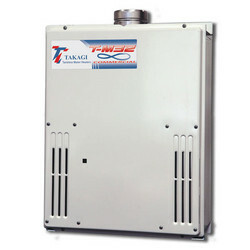 You may connect up to 20 units and generate over 180 GPM using a multi-controller unit. Uses HRS copper, the most durable copper in the industry. HRS copper is stronger and harder than the standard copper, making it much more resilient against erosion and leaks. Offers precise control of the water valves. 8 new dipswitch temperature settings: 100 F, 115 F, 120 F, 135 F, 145 F, 155 F, 165 F, and 185 F. These temperatures are better suited for commercial applications. 7-segment LED for error codes: Remote controller is not required to pinpoint problems. Ignition indicators: indicates which burner is fired up at the moment. Utilizes the air-fuel ratio rod for added safety. The drum thickness has been increased 25% for greater heat exchanger performance and to be more resistant to thermal stress. Increase in fin pitch: Fins are more “spread out” which improves the durability of the heat exchanger. More space in-between the fins reduces build-up. 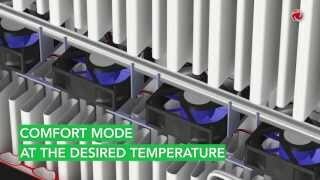 Higher temperatures at the top of heat exchanger reduces condensation.